The workshop of " myofascial pain and dry needling - head/neck/shoulder girdle" at The royal London hospital for integrated medicine hospital. It was not the first time, but it was a pleasure to meet Dr Robert Gerwin again for his myofascial pain workshop. Dr Robert Gerwin, a Board- Certified neurologist form Washington State, Medical Director of Pain and Rehabilitation Medicine in Bethesda, an associate professor in the Department of Neurology at John Hopkins University School of Medicine. He had the opportunity of training in the diagnosis and management of myofascial pain syndromes under the renowned Dr Janet Travell, and now runs a multidisciplinary pain clinic specialising in this field. Dr Gerwin is the author of over 30 peer reviewed articles, reviews, book chapters and consensus statements. he reviews articles for over a dozen medical journals. He is on the editorial board of the Journal of Musculoskeletal Pain, co-editor of the book Clinical Mastery in the Treatment of Myofascial Pain, along with Lucy Whyte Ferguson. 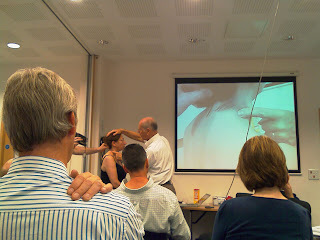 Dr Gerwin demontrasted on a participant during the course. The topic of these workshop was regarding myogenic headache ( headache origin from muscular pain.) and facial pain. Decades ago, it was believed that, headaches are causes by intercranial pressure pain ( the increase of pressure in the brain), but nowadays, a lot of the medical professional that working on muscles or myofascial, having a revolution thinking that majority of headaches causes by the muscle surrounding the neck and the head. Headache caused by a trigger point in the sternocleidomastoid muscle( a pair of muscles that located in front of neck) was described by Dr Travell 1955. 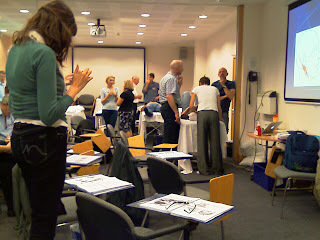 Dr Janet Travell explained further that headache caused by trigger points in the trapezius muscle, the sternocleidoastoid muscle(both are neck muscle), and the muscles of mastication(muscle surrounding the jaw), and noted the contribution of mechanical stress,including a variety of postural stresses, on the development of trigger points that could lead to headache (Travell J : Mechanical headache. Headache 7:23-29 , 1967). 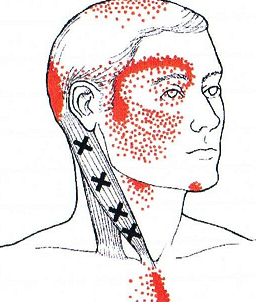 Referred pain pattern from the sternocleidomastoid muscle. Olesen, the first to estimate tenderness in the pericranial muscles during a migraine attack , and found that temporal , masseter( muscle over the face) and neck muscles were tender (Prevalence significance of muscletenderness during common migraine attacks. Headache 21:49-54, 1981) , (Electromyography of pericranial muscles during treatment of spontaneous common migraine attacks. Pain 14:137-147 , 1982) & (Pericranial muscle tenderness and pressure-pain threshold in the temporal region during common. Pain 35:65-70 , 1988). He also studied pericranial muscle tenderness in chronic tension type headache and correlated lower pressure pain thresholds and increased pericranial electromyographic activity with chronic tension-type headache (Muscular factors are of importance in tension-type headache . Headache 38:10-17 , 1998). Jensen studied 735 subjects from the general population , and found 22 with chronic tension-type headache. Muscle pressure pain thresholds were lower in person , particularly females, with chronic tension-type headaches, than the general population (Pathophysiological mechanisms of tension-type headache , in Copenhagen : Foreningen af Danske Laegestuderendes Forglag , 1998, p 68). Discussion and thinking during practical session. Every time after the workshop is a hard time for me, because I need time to digest all the knowledge which being delivered during the workshop, but, honestly, I really learn a lot, and have no regret to travel all the way from Malaysia to London, UK for it. Every time afterwards the branch is a harder time for me, because I charge time to abstract all the ability which getting delivered during the work. Thanks for sharing the nice information regarding the myofascial pain. It's very useful information for me. I like your approach regarding the myofascial pain. Dry Needling is one of the best method to release mental pressure as well as back pain.A new thing I learned from your blog that it is also effective for migraine treatments.By the way a fantastic article and full of information every of your articles.A great thanks on behalf of Ryde physio therapy team .